Monday Musings: Do YOU have the potential to be a fangirl? Brand loyalty is a funny old thing. Personally, I don’t think I’m brand loyal so much as product-loyal but I can definitely name a couple of brands that seem to attract super-fans. Liz Earle is the one that always initially springs to mind. Their supporters go crazy for the brand, the products, the shows… infact, both the brands that I had in mind when considering this post present on QVC. Coincidence? 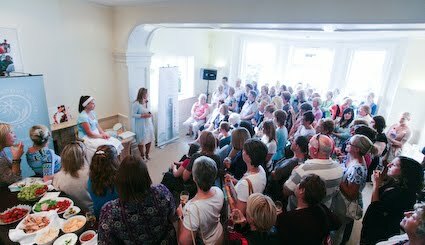 When I went to the Isle of Wight last year to attend Liz Earle’s 15th Anniversary Event… it opened my eyes. I didn’t realise that us women could be so passionate about a brand. Beauty in general? Yes. But a single brand? A company? A business? I was left bemused by the (literally hordes of) women doing their utmost to maintain a sense of middle-class decorum while simultaneously clambering to get close to ANYONE at the event who looked like they were representing the brand. It was the politest scrum I’ve ever been in! Of course, it helps that at the head of this company… is Liz Earle. Instantly likable on screen, she always appears effortlessly chic, calm and collected. When she opens her mouth, she’s eloquent, charismatic… engaging and most of all, appears interested in what others have to say. Yes, I’ll admit – I’m under her spell too. Infact, I won’t name names… but I was in the company of a perfectly intelligent blogger (kinda) who’s words as we left the room in which we’d been introduced to Liz went something along the lines of… “OMG… I want a mummy Liz. Do you think I can get her to adopt me?” Of course, it was said in jest… and incited a riotous giggle amongst a group of women who are old enough to know better but it showed the Liz effect in full force! I suppose that the phenomena could be attributed directly to the products. If you find the solution to a skincare problem that’s plagued you for years within your Cleanse & Polish, your interest in everything the brand releases is going to be piqued. And in all honesty, as superficial as we’re told all this beauty nonsense is… it runs deep for many of us. Infact, as I write that last paragraph, I’m beginning to feel a little shame-faced and hypocritical. I may not be evangelical about Cleanse & Polish (I don’t get the hype) but there is a certain product that I will forever hold in the highest regard and as such, it’s had a knock-on effect to the rest of this particular Antipodean brand. My fangirl self even gets annoyed when I hear of other people not loving their products as much as I do! Common sense? Where did you disappear to?! In analysing my own feelings for this brand, I can stem my cheerleading from the moment one of their products worked wonders on an issue that was troubling me in a way that did go deeper than the superficial. In solving the physical issue it also removed a weight from my shoulders. Oh dear… I’ve just thought of another brand that encourages my inner rah-rah girl. Sigh, there goes my delusions of being even just a tiny bit cool. Perhaps, before scoffing at what I perceive as other people’s foibles… I should remind myself that we all have a fangirl inside of us just waiting for that miracle product to bring her out, pom-poms flailing. Which brands do you think attract super-fans? Do YOU have the potential to be a fangirl? You made me a Lanolips fangirl too. I swear by this stuff. The fact I can get three tubes for what I used to pay for one lip balm helps (more money for lipsticks). I like the brands that have a personality behind them. Liz Earle is immensely likeable and she doesn’t over-promise, which I think is the key to her success. Lushies! Oh my God, Lushies! There’s nobody quite like them. When I worked there we had people come in who knew more about the products than the staff (and they train their staff incredibly well, even the Christmas temps). I guess it’s such a polarising brand that if you like it, you tend to really, really like it. I remember people being close to tears on hearing that their favourite thing had been discontinued! Was a fun place to work. bare essentuals seem to have a big fan base (although I actually prefer bella pierre as a mineral foundation). I guess once you switch to mineral you can’t go back? I actually stopped liking Liz Earle once she got ‘big’ and having read some things about the true nature of her ‘natural products’. Nah. I am always on the lookout for something better/newer. I love OCC Lip Tars but you just never know when something else is going to come along. So much stuff out there I have to try it all! Never buy the same thing twice. I have a bit of a hoarder/collector tendency so I tend to want all of a set at once…but I’m not very loyal with products and always think I can do better, sometimes I can and sometimes I can’t. I was going to say like Gemma, Lushies, I can no longer count myself as a true fan girl, but certainly I’ve always known what was coming before local staff did, more about the products in store than the staff did, right down to how things are made! I think Benefit gets quite a lots of fan-girls (I can count myself in there! ), especially with my age group (teenage). Even though I love many brands (and do like quite a bit of Liz Earle), there are few that I am such a Fan Girl for, one of them that immediately springs to mind is Ren as the products really helped my skin and are one of the few brands where I get along with most of their line and are my most repurchased. I do have to resist the urge to immediately buy a new product of theirs. I am becoming a bit of a fan girl for Lanolips too! I don’t think I’m a fan girl of anything..though just as I’ve written that sentence I find myself thinking of the products that I really love and for skincare, I think I’d be a Sanctuary fan-girl as I can’t stop gushing about their skincare products. I’m trying to think of others..I’d say 17 seeing as I’ve seldom been disappointed with anything of theirs and high end..probably YSL. There are brands I love, but I suppose I’m a “new things” fangirl – if something new is about to be released from a brand I like (any brand as long as I just like it), I obsess over it, mark the release date on my calendar, and then proceed to not buy it (I don’t live in the UK at the moment so I don’t have easy access!) I then bookmark it for when the time comes when I am finally able to buy it. I quite like Bobbi Brown but more for being my first grown-up brand than anything else. It’s not as if I know their ingredients off by heart or anything, that would be weird and very anorak of me. I’m a Shu Uemura Fangirl, it’s not like I have everything from the brand, but I love every single thing I have from them, and always covet their new releases (as well as current offerings and old discontinued products). For me it’s about finding a brand that just WORKS for you – a brand that you know you can expect good things from, and you get a strong sense of what the brand does, or the person or philosophy behind it. Oh! I’m also a fangirl for PCA Skincare, but no one has heard of them, LOL. Also – Ormonde Jayne, Serge Lutens, and CB I Hate Perfume in the fragrance world. I definitely agree with the people above- Lush is such a fan girl brand! It seems to have calmed down recently but there were so many posts about them last Christmas- everyone was going mad for them (myself included). Total 100% fangirl of ELEMIS! everything they make but especially the Collagen Marine Cream. I’m coming up 40…end of May and the number of people who tell me; I don’t have wrinkles or look my age….it’s all down to using good skincare. Yes, it’s expensive but it works! It makes such a difference to your day if you receive a compliment. I love this post, you have absolutely nailed it about brsnd loyalty and your friend’s comment about Liz Earle cracked me up (I have met Liz and she would be a great adopted mum!). Why did you not reveal the 2 brands that were your faves???! C’mon, spill! I’m a huge fangirl for Liz Earle, Bare Essentuals and Leighton Denny, obsessed isn’t the word! I have way too much! But even though these are my hero/go to brands I will still use other brands and like/love some other products, just not as much as I love my hero lines. I don’t think there’s any brand I’m actually loyal to, but there are a few that I get protective of when people criticise them, haha. If anyone has a bad word to say abut Barry M’s nail varnish or Bourjois in my presence, they’d better be ready for war.. Match your talons to your technology! My Wednesdays aren’t very wordless. I fail at not talking. Not a lot of snow here, just a grey old start to December. Christmas Gift Guide-a-palooza: Nailing it!